China’s newly invigorated space program has some ambitious goals, and one of them is something that’s never been done before — landing a spacecraft on the far side of the moon. The Queqiao relay satellite, launching today from the Xichang Satellite Launch Center in southwest China, will provide a vital link back to Earth. Although it’s sometimes called the “dark side” of the moon, it’s not actually dark. The moon circles the Earth and gets illuminated by the sun in a tidal lock orbit, meaning the orbital period matches its rotational period. In other words, the same side is always facing us, and that’s where nearly all lunar missions have landed. The Chang’e 4 mission will land on the surface and dispatch a rover for observation and analysis. Direct communication through the enormous mass of the moon is not possible, so Queqiao will provide a relay link to Chinese mission control. It will station itself at a Lagrange Point, a spot of gravitational equilibrium “behind” the moon as viewed from Earth. 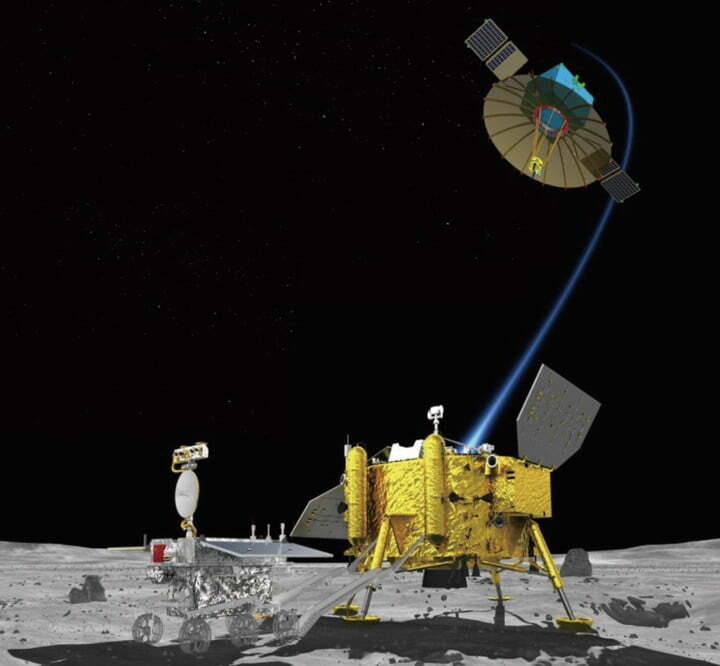 As detailed by Spaceflight Insider, Queqiao is part of Chang’e 4, China’s fourth lunar mission. The two Chang’e 1 and Chang’e 2 probes orbited the moon in 2007 and 2010, and Chang’e 3 landed a rover on the moon’s surface in 2013. The experimental Chang’e 5 T1 mission, launched in 2014, sent a capsule around the moon and returned to Earth. The capsule demonstrated its capability by surviving re-entry, and in 2019 Chang’e 5 will land on the lunar surface, collect rock and soil samples, then lift off and return them for scientific study. Aside from its relay duties, Queqiao also includes a radio scanner known as the Netherlands-China Low-Frequency Explorer. Because it’s in the “shadow” of the moon, unaffected by the Earth’s interference, it can search for ancient radio signals of very low frequencies dating back to the early formation of the universe and perhaps even the Big Bang itself. The lander-rover duo Chang’e 4 will launch and land on the moon later this year, and China has made no secret of their plans for a manned mission to the moon in the future. Serena tops and flops at the Italian Open.